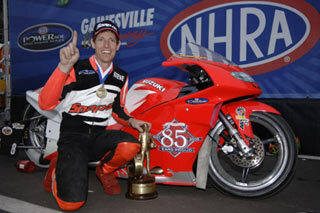 NHRA Pro Stock Motorcycle year veteran Steve Johnson has a longer run history than anyone in the class. He made his professional debut in 1987 by airfreighting his bike to the race track and pitting out of crate for the entire race. 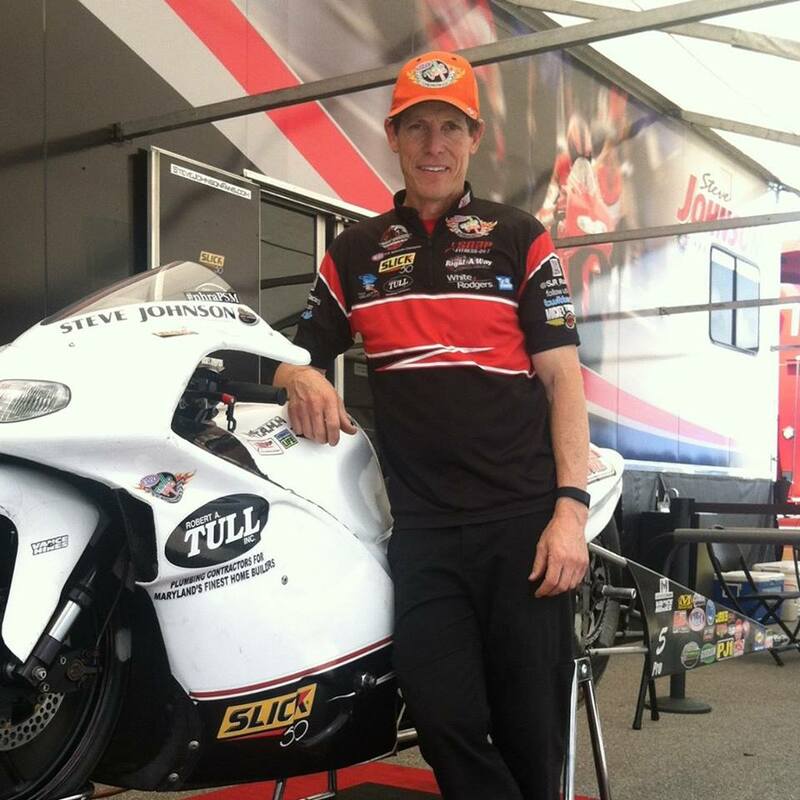 “I would make a run and then lean my bike on the pipe and go up to a tower suite and talk with potential sponsors,” Johnson said. Johnson remains one of the category’s most innovative and effective marketers, which has helped him stand the test of time in a financially demanding class. 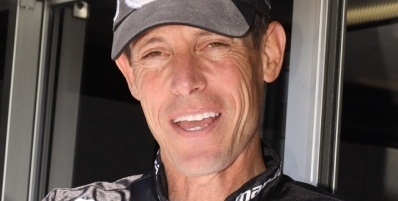 Johnson has amassed six NHRA event victories, appeared in 20 final rounds and established career-best performance numbers of 6.82 at 197 mph. Johnson’s ultimate goal is to capture a coveted season-championship. In 2017 he’s off to a great start with a semi-final appearance at the season-opening Gatornationals. It’s been a memorable and outstanding career for the charismatic rider. Perhaps he’s also had the most out-of -the-ordinary victories. Here Cycledrag.com looks back at the bizarre circumstances that surrounded two of Johnson’s three event wins. 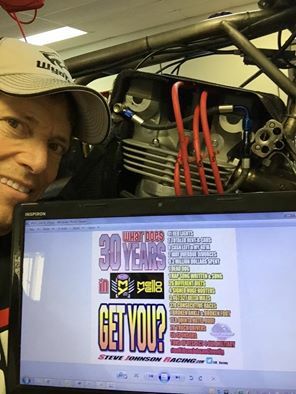 Steve Johnson shows what 30 years of NHRA Pro Stock Motorcycle got him. Steve Johnson and Matt Smith screamed down the Indianapolis launch pad side-by-side, and as the tandem crossed the finish line Smith’s win light illuminated and his crew began celebration. Smith had just captured his first “Big Go” title – or did he? 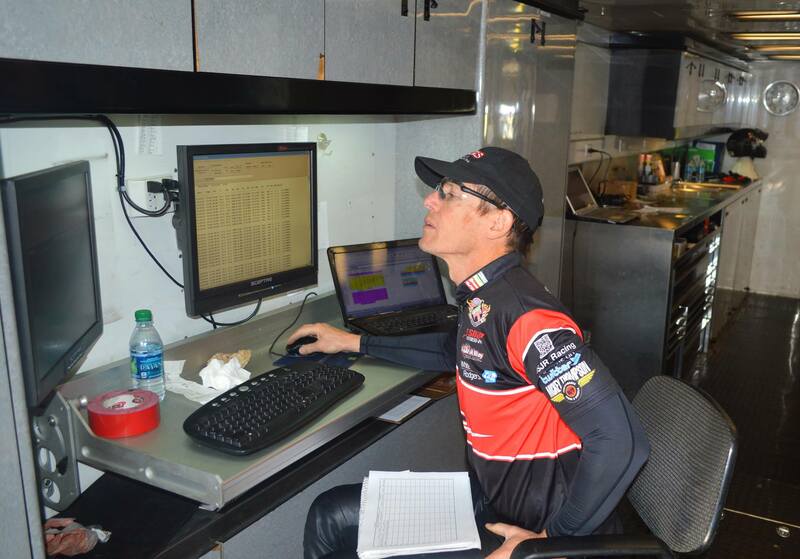 Television replays clearly showed Johnson ahead at the finish line – something NHRA officials couldn’t quite explain. Upon further review, 26 hours later, it was concluded that the leading edge of Johnson’s ultra slim front wheel somehow went unnoticed by the pulsating finish line beam. And so it was on Tuesday night after the race, Steve Johnson had won the 2005 U.S. Nationals. 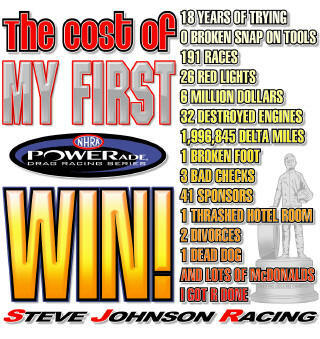 Johnson best summed up the price of his first win on his t-shirt – 18 years of trying, 0 broken Snap-On Tools, 191 rounds of racing, 26 red lights, six million dollars, 32 destroyed engines, 1,996,845 Delta Sky Miles, 1 broken foot, 3 bad checks, 41 sponsors, 1 thrashed hotel room, 2 divorces, 1 dead dog, and lots of McDonalds. However, even 18 years of racing couldn’t prepare Johnson for the unusual circumstance of his first victory. Johnson had no idea of the terrible buzz kill that lie ahead. 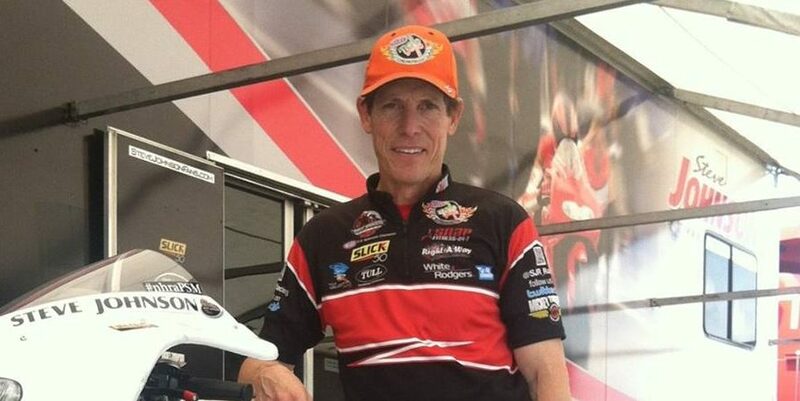 Johnson was yet to be informed his fellow racer and friend Darrell Russell had been killed in an on-track accident just hours before. All of the standard post-race festivities were cancelled. “To wait 18 years and not get a winner’s circle was a bummer but in the big scheme of things I am lucky that God gave me another day to come back and win another one,” Johnson said. 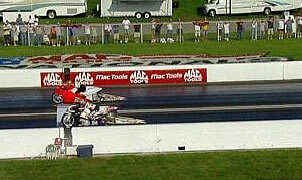 Johnson also won the 2005 Gatornationals from Gainesville, Fla. It was at this venue that he received his long awaited winner’s circle celebration. “I told the NHRA stat guys that they need two different columns for wins and trips to the winner’s circle” laughed Johnson.